You already know the ending. Of course, in some cases getting there is most of the fun. 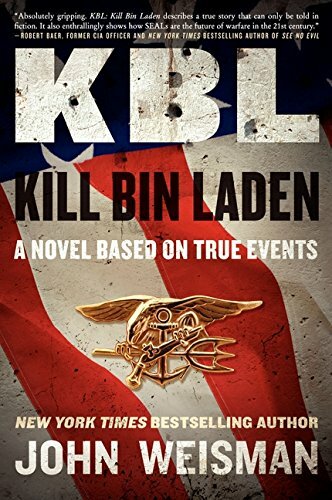 As if to acknowledge this fact, veteran black ops author John Weisman begins this fictional account of the final mission to take down Osama Bin Laden with the last page. Then he spends the next 300 weaving a tail of action and intrigue around the real-world events that led up to his starting point. Charlie Becker is a retired Ranger and double amputee who has been living in Abbottobad, Pakistan, for the last six months, playing the part of a homeless jihadi, wounded on the battlefields of Waziristan. Troy “T-Rob” Roberts is a baby-faced apple-pie-loving SEAL who has barely recovered from a deadly mission-gone-bad. On the first page of KBL, these two elite soldiers meet over the ghastly remains of the world’s most wanted terrorist. They share little more than a glance and a few words and then are whisked back five months to where their paths toward the inevitable collision begin. Mr. Weisman’s story puts the reader inside the workings of the Tier One units that finally ended the search for Bin Laden; and, not content with guns and spy gear, he also delves into the DC political maneuverings that led up to the attack, filling the gaps between documented events with behind-closed-doors fighting and scheming indicative of the real politicians his thinly masked characters represent. Weisman spares no one from either side of the political aisle. He simply calls it as he sees it, through the eyes of the patriotic warriors he has studied for so long. Mr. Weisman’s research is thorough, and there is no shortage of CIA and military lore woven into KBL’s pages. Occasionally this attention to detail bogs down the story, but most fans of military and espionage thrillers will enjoy the education these departures provide. For two decades, Mr. Weisman’s bestselling fiction and nonfiction work have offered an insider view into every black ops community. From the SEALs to Delta to the CIA, his shadow world contacts seem limitless. Now he brings them all together in a narrative so real that readers will quickly forget that it is fiction. As well, Mr. Weisman’s characters reach beyond this reality based story. Fans will likely demand to see more of Ranger Charlie Becker and SEAL Troy Roberts. What impossible odds will they overcome next?